Our Mom is the queen of improvisation, especially when it comes to entertaining. Whether she throws together an impromptu tray of smoked salmon on toasts, whips up a platter of lightly breaded chicken with pantry staples, or tops mini bowls of vanilla ice cream with a drizzle of caramel and sprinkling of sea salt, the focus is always on bringing people together over food and fun. We had this trend in mind when brainstorming dessert ideas for a Mother’s Day gathering. 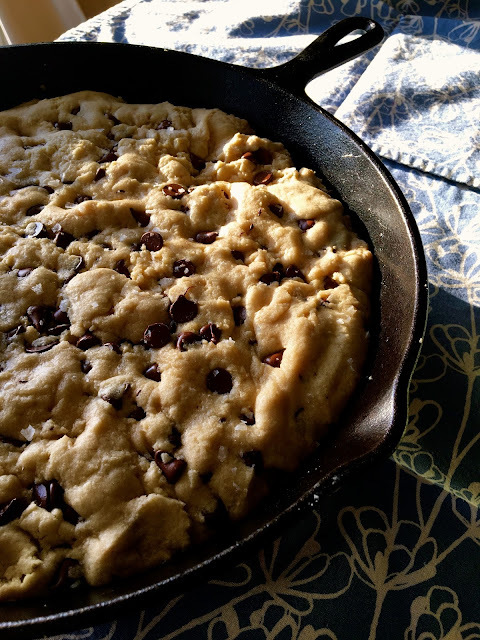 Instead of taking the time to individually form and bake pan after pan of cookies - why not pour the dough into a skillet and go from there? We added a couple special touches to a basic recipe, and the result was a gigantic, warm and melty chocolate chip cookie. We set the warm skillet on the table straight from the oven, and let everyone grab a spoon and delve in. The interactive method added even more fun to the moment! In a large bowl, add the flour, baking soda, and cinnamon and whisk lightly to combine. In a small bowl, microwave the butter for about 45 seconds. Remove and stir until the butter is just melted. If pieces are still in tact, that’s okay. In another large bowl, add the melted butter, granulated sugar and brown sugar. Beat on medium until soft and creamy, about 1-2 minutes. Add the vanilla and eggs and beat for 20 more seconds. Slowly pour in the dry ingredients and mix on low until combined. With a wooden spoon, stir in the chocolate chips and incorporate. Pour the batter into a cast iron skillet. Use your hands to spread the dough out across the entire surface. Sprinkle the surface with flaked sea salt. Bake for 20-22 minutes until the cookie is puffed up and slightly golden. Remove from the oven and enjoy. Serves 8-10. 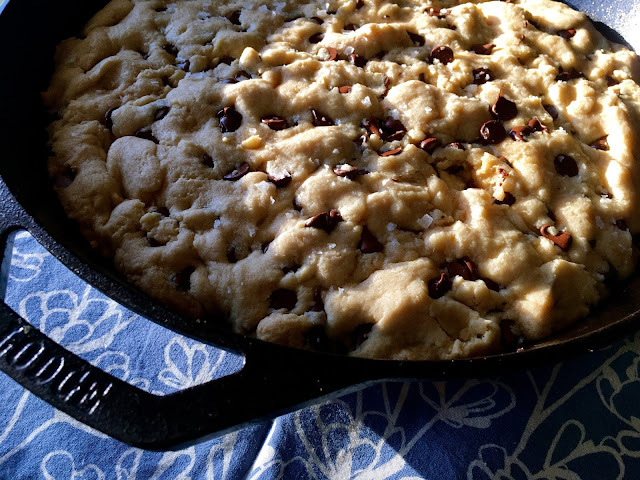 Feel free to convert any cookie batter to an instant skillet following our method above. You can kick it up a notch with scoops of ice cream, hot fudge, sprinkles and a dollop of whipped cream for a group sundae. Happy Mother's Day! !